David Cowan is a partner at Bessemer Venture PartnersBessemer Venture Partners, where he launched the firm’s investing practices in space tech, cyber security, cloud infrastructure and consumer tech. Tess Hatch is an investor at Bessemer Venture Partners, where she invests in frontier technology, specifically commercial space, quantum computing and drones. For 50 years, space innovation meant scaling Apollo-era technologies into ever larger, more durable satellites parked above their terrestrial clients in geosynchronous orbit. Exotic space-ready parts, militarized defenses and layered redundancies ballooned into multi-billion-dollar systems designed to last 40 years or more beyond their conceptions. Only vast organizations with thousands of aerospace engineers could participate. This new space stack promises a virtuous cycle of innovation, diversity and growth. The microsat revolution demands a new ecosystem to support the operators of these constellations. By far the most important and difficult input to procure is launch, because all mature rocket programs were designed long ago to carry enormous, expensive payloads to geosynchronous orbit (~36,000 km altitude) with five to 10 years of advance notice; new players like Virgin Orbit and Rocket Lab promise cheap and frequent carriage to LEO (less than 2,000 km altitude). 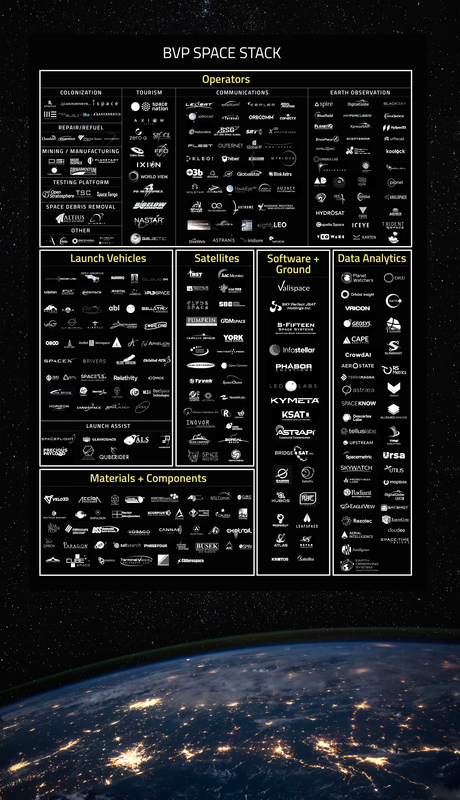 Thanks to Quilty Analytics for their help in building the Space Tech Stack. Click here for a PDF version.